Marc-Oliver Pahl | Research field of the group. My research falls into the area of Ubiquitous Computing. 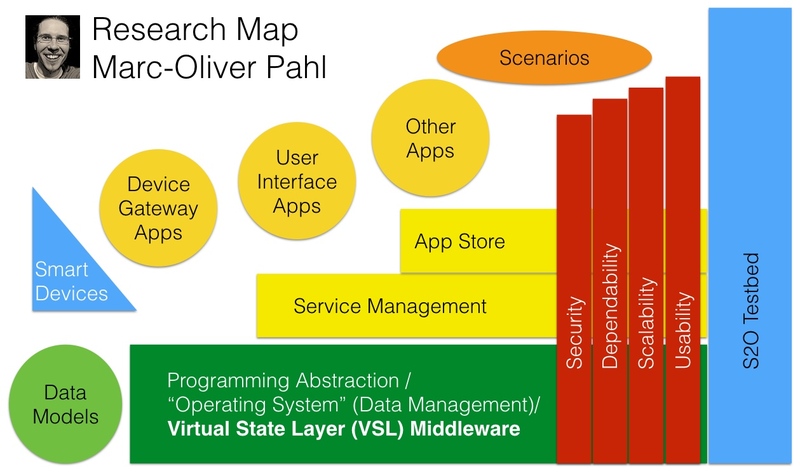 More particular, I am doing research in between the Pervasive Computing Domain and the System Management Domain. Our environments are full of technical equipment. Today it is possible to buy networked sensors and actuators to measure and interact with the physical environment in regular stores. So-called Smart Devices are embedded systems that allows to sense and actuate their environment from a remote location via software. Today, such Smart Devices can be bought for different purposes in regular stores. Examples are remote controllable power plugs, lights, or thermostats. Physical spaces that contain Smart Devices are called Smart Spaces. Managing the devices with software services is called Software Orchestration. A major challenge preventing our environments from being smart is the missing interoperability of the Smart Devices. Typically such devices use heterogeneous interfaces. There is no common platform to interconnect them. What is missing today is not suitable hardware but suitable software! I use the term Software Orchestration to describe the management of Smart Devices with software. Such software-based management is known from smartphones in a smaller scale. There, software (App) controls the Smart Devices, which are the camera, the screen, the microphone, the flash light, etc. Thousands of Apps can be downloaded from App stores to smartphones today. My goal is to create an ecosystem similar to the App economy for Smart Spaces. I want to enable that you can download Apps into your Smart Spaces in the future. This will have fundamental impact on the way we live as it can turn spaces that are mostly static today into something dynamic. Fig. 1: My research map. My main focus is on the green and yellow components. an App Store for global service App management. Security, Dependability, Scalability, and Usability are important vertical aspect. They are part of the previously named research areas. You can find more detailed information on past research in my publications. You can find more detailed information on currently ongoing research in my student topic list. My talk from IM2015 in Ottawa, CA. Here I present my paper M.-O. Pahl, “Data-Centric Service-Oriented Management of Things,” presented at the Integrated Network Management (IM), 2015 IFIP/IEEE International Symposium on, Ottawa, Canada, 2015, pp. 484–490..
My talk from MUCS/ PerCom2013 in San Diego, USA. Here I present my paper M.-O. Pahl and G. Carle, “The Missing Layer - Virtualizing Smart Spaces,” presented at the 10th IEEE International Workshop on Managing Ubiquitous Communications and Services 2013 (MUCS 2013, PerCom 2013 adjunct), San Diego, USA, 2013, pp. 139–144.. Besides the Smart Space research, I am continuously doing practical research on teaching methodologies. Since 2003 I am developing my iLab methodology for teaching in a mixed format with strong hands-on parts. In addition, I continuously experiment with new teaching formats. You can find more detailed information in my teaching section.